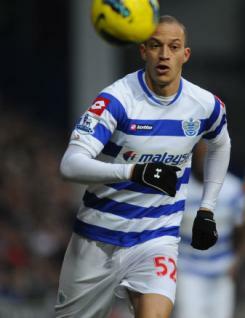 Bobby Zamora is a striker who signed for Fulham In July 2008. A bustling, energetic target man who can create chances for his colleagues, he is also a capable goalscorer. Bobby enjoyed an exceptional season for the Whites in 2009-10, scoring 20 competitive goals and firing the team to the Europa League final. He began 2010-11 in similar vein, scoring three early-season goals before suffering a broken leg playing against Wolves in September. The injury kept him out of action for almost six months, but he was back in the line-up for the closing stages of the campaign. Bobby first came to prominence as a prolific goalscorer with Brighton where he scored 83 times in 136 games. His form won him a move to Tottenham, but he struggled to make an impact at White Hart Lane. In January 2004 he signed for West Ham where he became something of a cult figure for the fans while establishing himself of Premier League quality. Having previously been capped for England at U21 level, he made his full international debut against Hungary in August 2010.